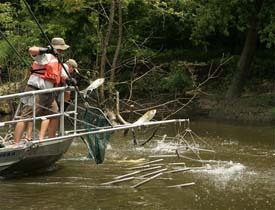 FWS workers try catching Asian carp, an invasive species in North American waterways. Asian carp are an invasive species in North American water systems. FWSThe largest sampling to date of Indiana waterways for environmental DNA (eDNA) evidence of Asian carp yielded negative results on either side of Eagle Marsh near Fort Wayne, University of Notre Dame researchers have reported. "The absence of any positive water samples collected from the Little River, Eagle Marsh, and the rivers in Fort Wayne is very encouraging," said Christopher Jerde of the Notre Dame Center for Aquatic Conservation. With assistance from Department of Natural Resources fisheries biologists, Notre Dame researchers collected 247 water samples from Oct. 18-20 in ditches and streams associated with Eagle Marsh, a 705-acre restored wetland near Fort Wayne. All samples were tested for bighead carp and silver carp environmental DNA (eDNA), and all tests came back negative. "We are pleased to have this good report and to see our Asian carp status is secure at Eagle Marsh," DNR deputy director John Davis said. "We are lucky to have an Indiana resource like Notre Dame able to respond in such a rapid and partner-like manner." Despite the good news, Jerde recommends the research efforts continue. "It is our hope that further sampling in the region yields the same result," he said. "Surveillance for any invasive species, including Asian carp in the Wabash, is not a one-and-done project." Doug Keller, aquatic invasive species coordinator for the DNR, agreed. "Additional sampling in the spring under higher flows and during a time when Asian carp spawning may occur is a likely time for the next round of sampling," Keller said. "Coupling additional eDNA samples with planned Asian carp tracking and spawning studies will tell us a lot more about Asian carp use in the upper Wabash basin." Notre Dame received a Great Lakes Restoration Initiative grant to work with the U.S. Fish and Wildlife Service to help protect the Great Lakes from invasive species by further developing and applying eDNA surveillance. Since 2009, Notre Dame researchers have examined more than 1,000 water samples from rivers in Indiana, Michigan, Ohio and Wisconsin, screening them for traces of DNA markers to determine if a target species has been in the vicinity. "Using environmental DNA as an early detection method is much more sensitive than traditional fisheries methods like electro-fishing and netting for Asian carp," Notre Dame researcher Andrew Mahon said. The eDNA surveillance approach in the Chicago Area Waterway System showed presence of Asian carp eight months before commercial fishermen hired by the Illinois Department of Natural Resources captured a bighead carp in Lake Calumet, approximately six river miles from Lake Michigan. "In the Eagle Marsh application, it was also a matter of practicality," Mahon said. "Many of the areas that needed to be surveyed were not accessible by boat and not conducive to setting nets. All we needed were two-liter water samples." Of the samples collected, 28 were taken from the Wabash River near Huntington, 60 from the Little River, 18 from Graham-McCulloch Ditch, 14 from Junk Ditch, 31 from Eagle Marsh, nine from Aboite Creek, six from Robinson Creek, 21 from the St. Marys River, 34 from the St. Joseph's River, and 17 from the Maumee River. Nine cooler controls also were processed. The region was identified as having favorable conditions for the potential spread of Asian carp into the Great Lakes. Eagle Marsh straddles a geographic divide separating the Wabash River watershed from the Maumee River watershed. Under normal conditions, there is no direct link between the two watersheds, but tributaries and ditches associated with Eagle Marsh provide a potential connection under certain flooding situations. Concerns that Asian carp could move upstream from the Wabash during flood conditions, cross the divide at Eagle Marsh and enter the Maumee drainage prompted the DNR to construct a 1,200-foot chain link fence at Eagle Marsh in October to block fish passage. The U.S. Environmental Protection Agency and the U.S. Fish and Wildlife Service are funding the cost of the fence project through the Great Lakes Restoration Initiative. Bighead and silver carp are two species of Asian carp that were imported into the southern United States to keep aquaculture facilities clean and to provide fresh fish for markets. Both species are voracious eaters, consuming plankton - algae and other microscopic organisms - and stripping the food web of a key food source for small and large native fish. The Asian carp escaped into the wild in the 1980s and have been moving northward ever since. They were first detected in Indiana waters in 1995 and have worked their way up the Wabash River, into the East and West forks of the White River, the Patoka River, and the Ohio River and some of its tributaries.